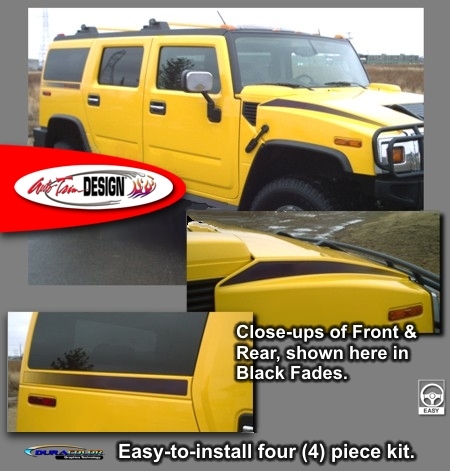 Set your Hummer H2 or H2 SUT apart from the rest with these simple yet attractive Hood and Rear Body Side graphics. Available in four (4) fade colors, hood and rear graphic pieces feature a unique fade to the vehicle's paint color as shown. As an extra step, graphic pieces are over-laminated with a 2.5 mil clear laminate which will protect the graphics from miles of abuse. Graphic kit is precut, easy-to-install and requires no trimming. Kit is packaged with one (1) Driver Side and one (1) Passenger side graphic set.